This spaghetti was a total hit at our house. Comforting, filling and healthy to boot. Since there isn’t much going on around here except for snow (and more snow after that) I’ve continued to cook up a storm. This recipe is perfect for a cold winter night and we were really happy with how it turned out. The cauliflower sauce is versatile and would be great drizzled over lentils, roasted sweet potatoes or even as a white sauce on pizza (I’m trying that soon!). We used an entire head of garlic in our sauce but for folks who are sensitive to garlic (which mellows in taste when it’s roasted) I suggest adding half of the garlic to the sauce first and taste testing as you go. 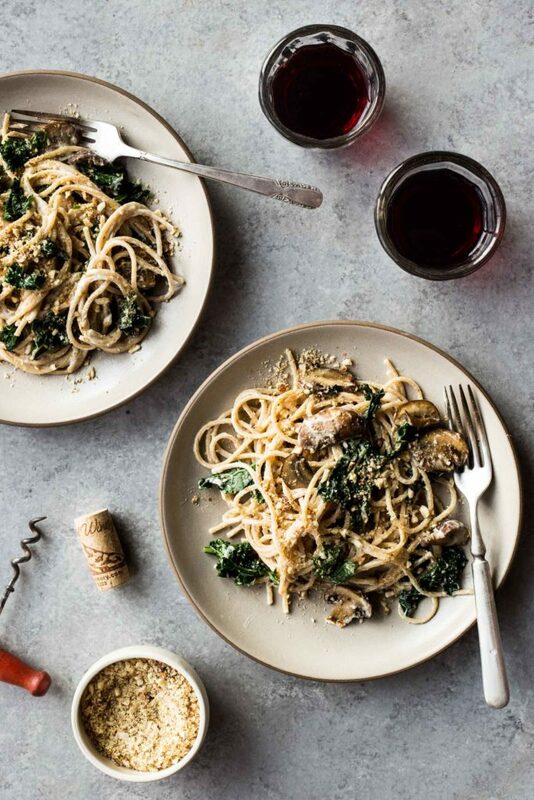 This spaghetti was great with the addition of sautéed mushrooms, kale and a little toasted almond crumble. This meal requires a few different steps and the dishes can accumulate so make sure to pour yourself an extra large glass of wine and pump up the music while you prepare this. It’s worth the added dishes and you’ll be happy with the meal once you sit down to eat. Also–the almond crumble is great garnished on soups, avocado toast, roasted veggies and salads so I hope you don’t mind having leftovers of that. You’ll quickly find a jar doesn’t last that long on the counter! Anyhow, I hope you all love this hearty pasta as much as we do. Pour a glass of wine and dig in. Cheers from a very snowy Tumbleweed Farm. Preheat the oven to 400F. Peel and discard the outer layer of papery skin on the whole head of garlic, leaving the thin layer of skin on each individual clove. Use a sharp knife to cut about 1/2 inch off the top of the garlic head exposing the tops of each clove. Drizzle the garlic with a little olive oil using your fingers to rub it evenly over the garlic. Wrap the garlic head in aluminum foil and roast for about 30 minutes, or until the garlic cloves are soft and tender. When the garlic is cool enough to handle carefully squeeze out the individual cloves from their skins into a small bowl. Set aside. While the garlic roasts combine the cauliflower with the veggie stock in a saucepan and bring to a boil (if the stock doesn't cover all the cauliflower add more broth or water to cover by about 1 inch) Reduce the heat and simmer until the cauliflower is fork tender, about 15 minutes (don't drain!) Use a slotted spoon to transfer the cauliflower to a high speed blender. Add 1 cup of the reserved cooking liquid, the butter, the almond milk and half of the roasted garlic cloves. Season with a little salt and pepper and drizzle in the lemon juice. Blend on the highest setting until the mixture is completely smooth and creamy. Taste test and add the remaining garlic cloves if desired. If the mixture seems too thick (you want a consistency of a thick alfredo sauce) add more milk or broth as needed. Place all the ingredients for the almond crumbled in a small food processor. Process until the mixture resembles a coarse meal. Taste for seasonings and set aside. Cook the pasta in boiling water until al dente. Drain and keep to the side. Heat the olive oil in a large heavy bottom skillet over medium-high heat. Add the mushrooms, thyme and a pinch of salt and pepper. Cook, stirring occasionally until they become tender, about 10 minutes. Stir in the kale and continue to cook until the kale turns bright green and tender, about 5 minutes. Add the pasta to the skillet along with the cauliflower sauce. Toss until evenly coated. Divide between plates and top with a few pinches of the almond crumble. Love your recipes and look forward to each new one. This sounds wonderful. I have been looking for an alternative to a cream sauce and can’t wait to try it. Also love seeing pictures of the snow and Henry. Good luck through the storms. Now, this really sounds great – all those beautiful ingredients. Made this today for lunch & it’s awesome. My big hairy carnivore husband was skeptical to say the least but he loved it. Now to see what the kids think. I’m thrilled that I’m eating my veggies but it feels like I’m eating a more delicious version of alfredo. Oh & that crumble stuff is going on everything from now on. Hi Andrea, from across the pond (UK). I’ve made several of your recipes since discovering you last year, and this is another winner! Made the crumble with pumpkin seeds instead of almonds (darned allergies!) – delicious! Love reading your blog – thanks for all the time and love you pour into it. It’s “Chicken Soup for the Chilly Soul” for lunch tomorrow – my fave! I just tried this tonight and I’m in heaven! I used brown rice noodles to keep it gluten free and added a pinch of nutritional yeast to give it that cheesy alfredo flavor…. so, so good. Thank you for the recipe! Yay! I’m so happy you love this too! Happy Cooking! I’ve been eyeing this since you first posted and made it last night. Hubby LOVED it. I used homemade unsalted veg stock so it needed a lot more salt and lemon, and I added red pepper flakes to the shrooms. Might add miso to the next batch. Excellent base sauce. Andrea I live in Mosier, pls tell me I will be able to get your book in HR.